A bus driver accused of being so tired that he caused one of the deadliest crashes in New York City’s history was found not guilty of manslaughter and negligent homicide on Friday, underscoring the difficulty of prosecuting drowsy driving despite successful efforts to use the courts to discourage other dangerous habits while at the wheel. The driver, Ophadell Williams, was returning to Chinatown from an overnight trip to the Mohegan Sun Casino in Connecticut last year when his bus struck a guardrail on Interstate 95 in the Bronx, flipped over and ripped open. The crash killed 15 of the 32 passengers and injured many more, including one man whose arms were torn off as he tried to shield his face. The trial, which started in late September and featured sometimes harrowing testimony from 55 witnesses, centered on the legal question of whether a driver can be proved to be too tired to responsibly get behind the wheel, an effort hampered by the lack of obvious measures like a blood-alcohol test for drunken driving or cellphone records for distracted driving. Prosecutors portrayed Mr. Williams as being so sleep deprived that his reflexes were affected as if he had been intoxicated. But a lawyer for Mr. Williams, suggesting that driving without a full night’s sleep is a common practice, said the trial represented a misguided effort to find someone to blame. After five days of deliberations, the jury in State Supreme Court in the Bronx acquitted Mr. Williams of all but one of the 54 charges. He was found guilty on a single misdemeanor charge resulting from unpaid tickets, which carried a sentence of up to 30 days, compared with up to 15 years for the most serious charges. Mr. Williams, 41, reacted with visible relief as the verdict was announced, rocking back and forth in his seat, at times wiping his eyes and putting his face in his hands. He had been in jail since September 2011, unable to afford his bail, including a final night Thursday after the jury reached a verdict, because the judge overseeing the case said there had been no time to announce it. Mr. Williams’s sentence on the misdemeanor charge was commuted to time served. Mr. Williams nodded at the jurors as they filed out, raising his right hand in a gesture of thanks. He walked out of the courtroom holding hands with a young relative, his smiling wife beside him. He declined a request through his lawyer to be interviewed. As jurors left the courthouse, they declined to discuss their deliberations. The jury forewoman, who would not give her name, said only that deliberations had been "very difficult." Another juror, who also would not give her name, said: "It was a very difficult decision to make. I have nothing further to say." The verdict was a blow to the office of Robert T. Johnson, the Bronx district attorney, in what had been viewed as a precedent-setting case. Mr. Johnson issued a statement defending his decision to prosecute Mr. Williams. Gary Weil, the assistant district attorney who led the prosecution, said it was simply difficult to prove that Mr. Williams had not slept enough, despite the fact that "he’s a bus driver and he’s responsible for those lives." "We put forward the best case we could have," Mr. Weil added. "There was nothing more we could have given the jury." Several relatives of the crash victims expressed disbelief and disappointment at the verdict. "I don’t like the jury’s decision, but I accept it," said Florence Wong, whose father was killed. "He’s still responsible for the crash. He’s the driver." The trial was followed closely by traffic-safety advocates who had hoped it would legitimize efforts to prosecute people who drive when they are dangerously tired. States have increasingly sought to move beyond purely educational efforts, with criminal cases against drowsy drivers in more than a half-dozen other states, including Florida, New Jersey and Texas. 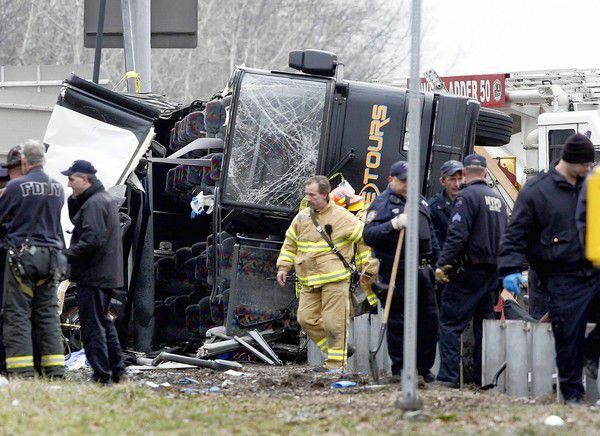 In Virginia last month, a judge convicted a bus driver of involuntary manslaughter after the authorities said he fell asleep before a crash that killed four passengers and injured dozens of others. In the Bronx case, aware that the charges would be difficult to prove, prosecutors presented Mr. Williams’s cellphone and car-rental records to try to show that he was awake and cited the findings of a sleep-disorders specialist who surmised that Mr. Williams had averaged about three hours a day in the three-day period before the crash. They presented evidence that Mr. Williams was speeding and driving erratically before the bus flipped over. Mr. Williams’s lawyer, Patrick L. Bruno, countered that his client worked long hours just like other professionals and had been rested enough to drive. Mr. Bruno maintained that Mr. Williams lost control of the bus after being cut off by a tractor-trailer, not because he was tired — a claim prosecutors dismissed, saying there was no evidence that Mr. Williams tried to apply the brakes before the crash. Mr. Williams did not testify, and Mr. Bruno did not call any witnesses. Mr. Bruno said Friday that Mr. Williams was anxious to return to work as either a bus or limousine driver. He said that all through the trial, Mr. Williams "felt terrible that the lives were lost" but at the same time he believed "he was being made a fall guy." Mr. Williams still faces pending civil lawsuits filed by survivors and relatives of those killed in the crash. David P. Kownacki, a lawyer representing Ren Xiang Yao, the man who lost both arms, said he was confident that Mr. Williams would be held responsible for the crash in a civil case. "Running a bus off a highway might not be a crime, but it’s certainly negligence," he said.